We made it to Day 20 — woohoo! If you’ve followed along and joined me in any or all of the daily freezer cooking challenges, you deserve a huge congratulations for making it this far. Chocolate Banana Bread is usually really simple to whip up. But it took me longer than usual this time around. First off, I mixed the dry ingredients together and got ready to add the cocoa only to discover we had no cocoa. I was confused as to why on earth this chocolate-loving family would be out of cocoa — especially since I was sure we had just had a full container. …A few weeks ago when I was baking something with Silas, I left the kitchen table where we were working to go get something from the refrigerator. I got sidetracked doing something else in the kitchen for a minute and forgot to pay attention to what was happening at the kitchen table. Big mistake. At any rate, I had to make a quick trip to Walmart to get some more cocoa. I figured Walmart would have a good price on some generic brand of cocoa.Wrong. I discovered that Walmart only stocks Hershey’s or Tollhouse (what’s with that?! ), so I paid a whopping $2.58 for a canister of cocoa and tried again to make the bread. Where oh where could the camera card be? I searched high and low — only to finally find it in the load of clean laundry in the dryer. I had stuck it in the pocket of my jeans the day before and it made it through the washer and dryer unscathed. Hey at least it wasn’t buried at the bottom of the freezer like my camera cap! Finally, I was able to get the recipe finished! Mix together the flour, cocoa powder, sugar, baking powder, baking soda, and salt. Stir the mashed bananas, eggs, melted butter, and vanilla. Carefully fold the banana mixture into the dry ingredients until just combined. Mix in the chocolate chips. Pour into a greased loaf pan. Bake at 350 degrees for 55 to 65 minutes until the bread has risen and a toothpick inserted in the center comes out clean. To freeze: Cool completely. Slice and wrap in plastic wrap and foil or in a ziptop bag. Store in the freezer. To serve: Pull out desired number of slices. Thaw at room temperature for 30 minutes to an hour. Or, warm in the microwave. This recipe is one of our longtime family favorites. 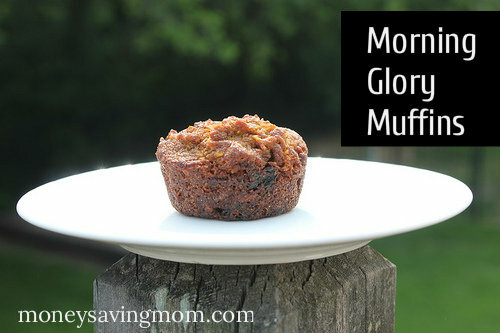 These muffins are so good and freeze so well. These also make a great dessert to add to a sack lunch. Just pull a frozen muffin out and stick it in a baggie in your sack lunch and by lunchtime, it’s all thawed and ready to eat. If you want to try a bit of a different and healthier twist, using sweet potatoes, whole-wheat flour, and less oil. In a large mixing bowl, beat eggs, sugar, pumpkin, and oil until smooth. Add in dry ingredients and mix well. Fold in chocolate chips. Fill greased or paper-lined muffin cups 3/4 full. Bake 16-20 minutes at 400 degrees. To freeze: Thoroughly cool muffins and stick in an airtight freezer bag and freeze for up to 6 weeks. To thaw: Let muffins thaw at room temperature for 30 minutes to an hour. Or, defrost individually for 1-2 minutes in the microwave. Did you do any freezer cooking today? If so, I’d love to see the results of your efforts! Link up your blog posts below or tell us about your success in the comments. So, I’m a day behind where I’d hoped to be, but I’m still plugging along — and can see the finish line in the very near future. Yay! And yay for a freezer full of good food! Today’s project was making Energy Bites, a recipe I initially discovered on . This recipe is delicious, packed with nutrition, and so easily adaptable. Mix all ingredients together. Roll into balls. To freeze: Place balls on a cookie sheet and freeze for one to two hours. Remove from cookie sheet and place in an airtight ziptop freezer bag (or other airtight container). 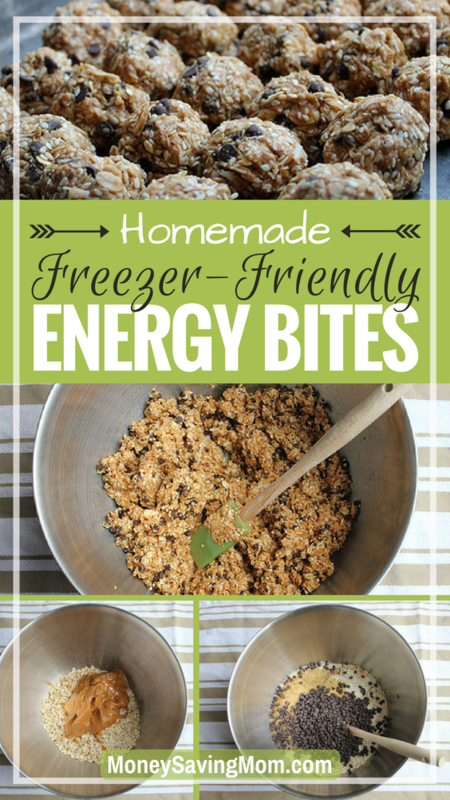 Makes around 3 dozen energy bites. These muffins are delicious and nutritious. When my friend, Angie, brought us some one day, I took one bite and knew they were winners. I’d recommend using muffin liners, if you buy them, as they seem to help these be a bit more moist. However, they are still delicious with less sugar and without muffin liners. I used pureed carrots instead of shredded carrots this time around as that is what I already had in the freezer. I think it works a little better with shredded carrots — and the batter doesn’t look so orange, either! Preheat oven to 350 degrees F. Grease 12 muffin cups, or line with paper muffin liners. In a large bowl, mix together flour, sugar, baking soda, cinnamon, and salt. Stir in the carrots, raisins, coconut, and apples. In a separate bowl, beat together eggs, coconut oil, and vanilla. Stir egg mixture into the carrot/flour mixture, just until moistened. Scoop batter into prepared muffin cups. To freeze: Cool completely and put in an airtight ziptop freezer bag. To thaw: Pull out the desired number of muffins and thaw at room temperature for an hour or so. You can also warm them in the microwave. If you’re not a fan of most freezer meals, can I encourage you to try making cookie dough and freezing it? I can almost guarantee you won’t be able to tell a difference between frozen cookie dough and fresh cookie dough. My sister concocted this recipe many years ago and it’s long been our favorite chocolate chip cookie recipe. It definitely wouldn’t win the prize for being a low-calorie cookie, but it’s a delicious and hearty cookie recipe. Cream together first six ingredients. Add flour, baking soda, salt, and oats. Mix well. Stir in chocolate chips. Roll into 1-1 1/2-inch balls. To freeze: Place cookie balls on a cookie sheet and freeze for one to two hours. 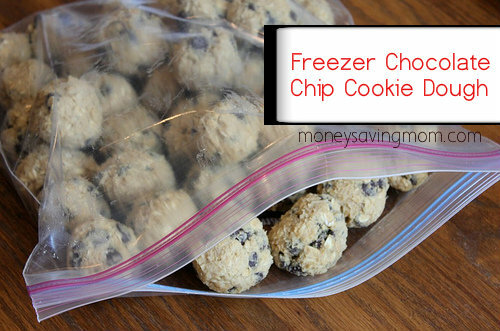 Remove from cookie sheet and place in an airtight freezer bag. To bake: Pull out the desired amount of balls and place on a greased cookie sheet for 30-45 minutes to thaw. Bake at 375 degrees for 10 minutes or until done. This is one of our go-to meals. It is so, so easy and delicious. You could skip the freezing part altogether and just make it the day of, but some times it’s nice to pull a bag out of the freezer, dump it into a pan or crock pot and dinner is done. It’s a great summer recipe because you can grill it or cook it in the crock pot and not heat up your kitchen at all. We love it served over rice or sliced and served on a big salad. While I was making the Italian Chicken on one end of the table, the above picture is what was happening at the other end of the kitchen table. Seeing my husband so intently working with Silas on his preschool and Silas just soaking it up melts my heart. To freeze: Put frozen chicken breasts in a freezer bag. Pour the Italian dressing over the chicken. Squeeze the air out of the bag and seal it up. Freeze. Quick Method: Pull frozen chicken out of the freezer and run the freezer bag under cold water to thaw slightly. Pour all the contents of the bag into a 9×13-inch baking dish. Cook at 350 degrees for 45 to 60 minutes. Longer Marinating Method: Pull frozen chicken out of the freezer, stick the bag in a bowl and let it thaw in the refrigerator for up to 24 hours. Pour all the contents of the bag into a 9×13-inch baking dish. Cook at 350 degrees for 45 to 60 minutes or grill until done. *Want to change things up a bit? You can also use barbecue sauce or any other favorite salad dressing. Let us know if your family has a favorite variation of this recipe! У нашей организации популярный веб портал с информацией про https://winnerlex.com.ua.